It’s Saturday morning.. You’re at breakfast with all your girls talking about the latest fashion trends, beauty products and everything else girly under the sun… Then all of a sudden one of your friends invites all of you to a football game… THE NEXT DAY! What’s the first thing that runs through your mind? A. WHAT DO I WEAR?!?! B. What do I need to bring?! C. We have a football team…? 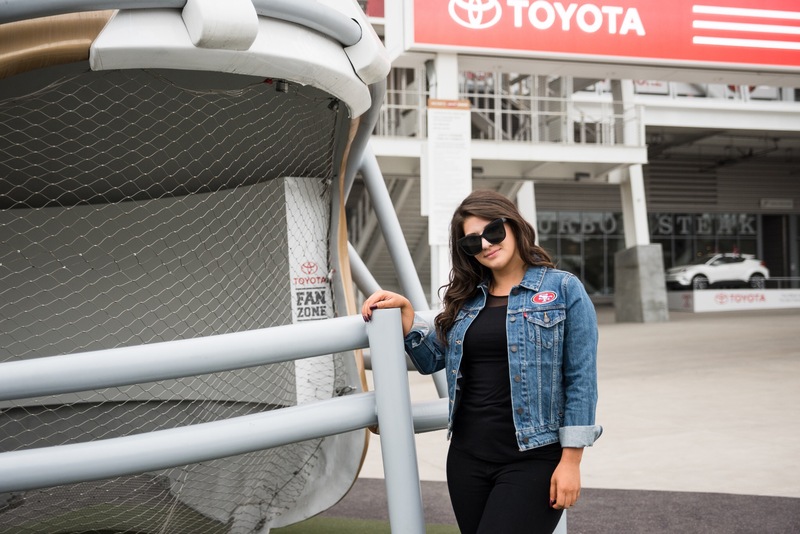 These are all valid thoughts haha but the questions I hear the most are: “What do I wear to a football game?” and “What do I bring?” WELLLLLL… I’m here to help! I thought I’d share one of my Game Day looks and necessities! 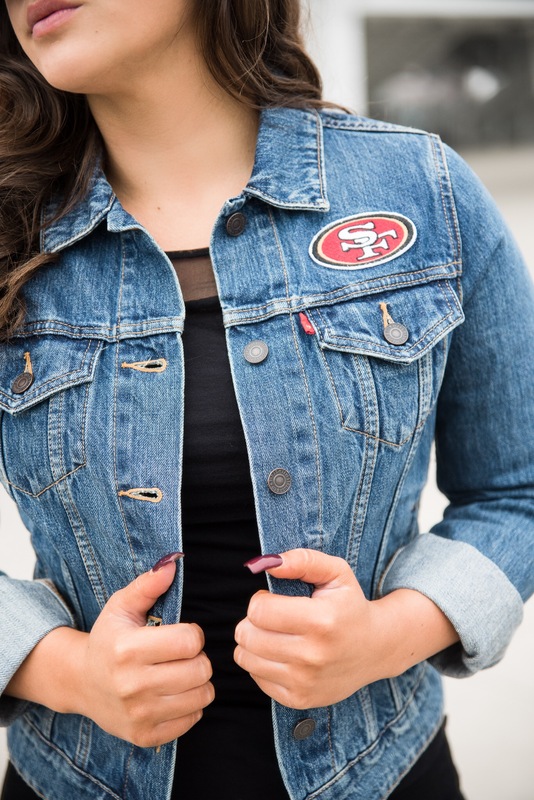 Levi’s has the cutest NFL jean jacket line right now (THAT’S ON SALE! 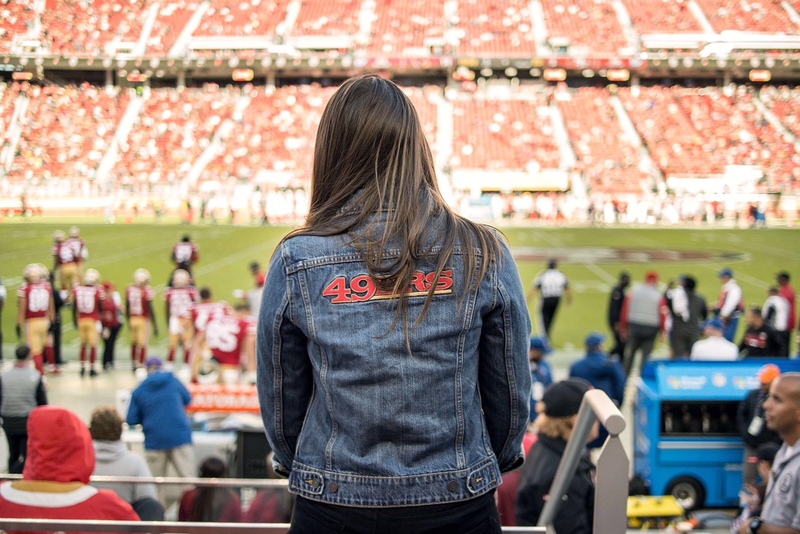 ), so I went with the 49ers one of course! It has the SF logo on the front and “NINERS” on the back! I paired that with my FAVVVVV pair of black jeans, a comfy black top and either a pair of sandals or tennis shoes (depending on the weather and my mood). Andddd of course, you gotta have the shades! Our seats are in direct sunlight! So I never forget my go-to pair of black sunnies and finish off the look with a gold cross necklace. 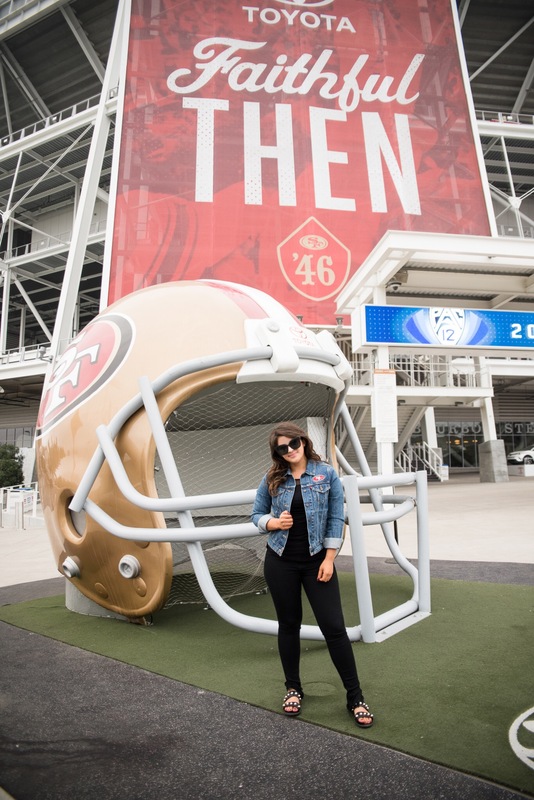 There are definitely girls who can rock heels at a game though, so if that’s you, by all means.. GO FOR IT!! But if you’re looking for a more casual look, here’s mineeeeee! *Keep scrolling to see my Game Day necessities! 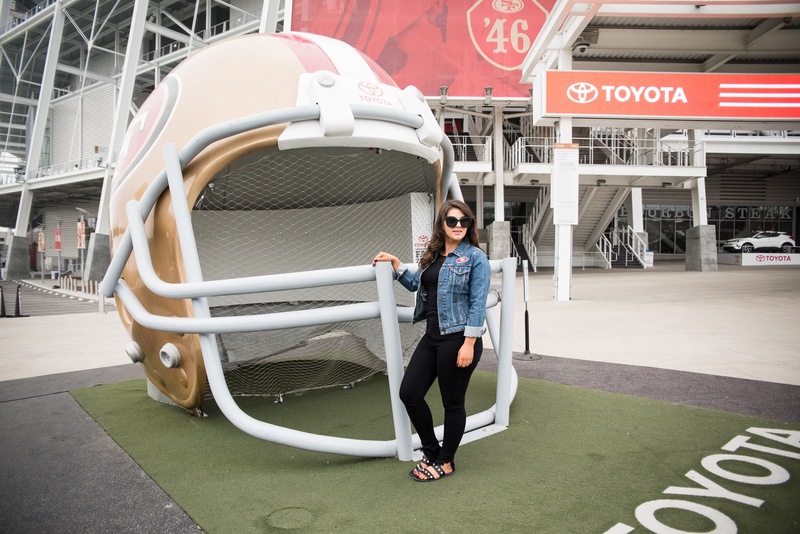 For more football fun, click here for the 49ers Significant Others Luncheon! Previous Post Why I Went MIA.. Thank you!! They have so many good ones! Love how you’re reppin your mans team! Casual is the way to go! You really look so perfect! Great outfit and fabulous tips ! You’re so sweet Jennifer! Have a great weekend! Right you are! Thank you so much! This is the perfect game day outfit!!! I love that denim jacket! I’m with you, totally need the red vines!!! Right?!! They are so delicious!! LOL! That jacket is so perfect for this event! You look fab and hope you had fun! Thank you! I had a blast!! Gorgeous lady! This is one of my go-to outfits for sure!! A denim jacket is a must! Right?! Denim is always my go-to! That is so cool… casual and comfy. I adore your passion for your mans team and that is a really cute thing to do. This is such an awesome jacket! I didn’t know they made this. It is such a cute way to rep your favorite team. Love it.